Undertaking a task mindfully – a practice derived from yogic philosophy – has become a worldwide phenomenon. We are all beginning to become more aware of the workings of our mind and body. We are looking deeper in order to understand why we think the way we think and how different practices, activities, foods and drinks affect us. Being mindful in the things we do reduces stress, increases gratitude and motivation, and most importantly, is highly beneficial to our health and wellbeing. Mindful eating can be simply described as being fully present with the eating experience. To put it even more basically, it is the act of sitting, eating and doing nothing during meal times. Mindful eating has many benefits; in the past, it has been found to improve many digestive disorders and negative eating habits. It is also regularly prescribed for weight loss regimens. There is a large amount of scientific knowledge describing how overeating, weight gain and bad digestion can be the result of now chewing properly, eating quickly and not being mindful of the eating process, quantity and feeling. In today’s society, we are presented with unhealthy, fast, deep-fried and junk foods on a daily basis. These foods are addictive and seriously damaging to our health but are incorporated into our life through socialising, emotional eating and a great lack of attention to how such foods are making us feel. 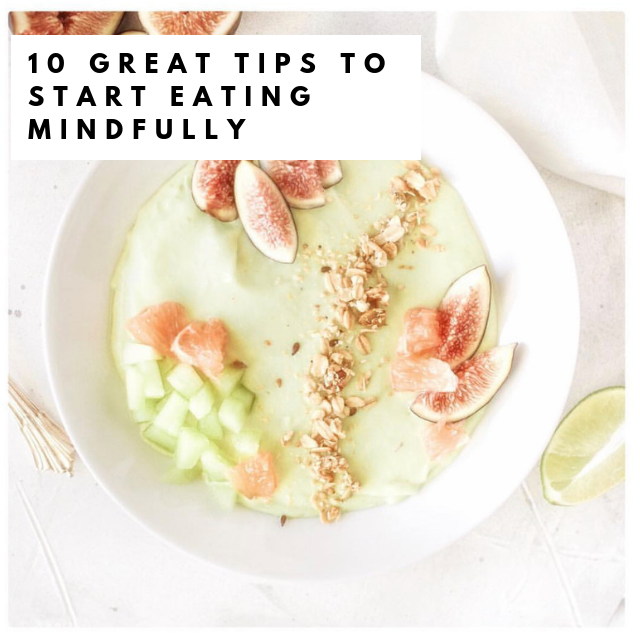 Mindful eating helps eliminate bad eating habits such as overindulging in junk food and eating in the absence of hunger. It is also highly effective in reducing binge-eating disorders. Mindful eating increases our awareness on our food, and helps us enjoy evert morsel of our meal: awareness during meals stimulates the satisfaction of eating. Changing bad habits – like all bad habits – takes time, effort, practice and concentration. Replacing bad habits with healthy eating habits encourages us to consume less and to thoroughly enjoy what we eat. By chewing food completely and thoroughly, every inch of a meal is savoured. It also gives the body time to begin the digestion process before the food hits the stomach. This is a good time for the tongue – the only element of the body that enjoys the flavour of a meal. It is very important to adequately clean the tongue regularly by gently scraping it. The “ama” – toxic substance – sitting on the tongue affects how food is tasted. A cleaner tongue will allow tasting all of the complex flavours within a meal. Putting the knife and fork down after each bite. This slows down the eating process and encourages thorough chewing. It also helps shift the awareness fully to the food being consumed, rather than on the next forkful. Using the less-dominant hand to eat makes the whole eating process a little more difficult in a positive way, as one needs to pay more attention to when the least dominant-hand is being used. The very idea of paying close attention and letting the rest of the world fall away is the basis of mindful eating. Trying to identify every ingredient in the meal is especially interesting when eating at a restaurant or whenever someone else has prepared the meal. It is a great way to be completely mindful in the eating process and remain focused. Taking the first bite with closed eyes. Vision can be significantly distracting during the act of eating. When the sense of vision is inactive, it becomes easier to focus solely on the taste of the food. Awareness should be placed on the act of chewing, as well as the different textures and tastes within the meal. It is important to make each meal a formal and beautiful experience. Every part of a meal should be enjoyed, from the cooking process to the eating and formal dining experience. Sitting at a table helps the brain to completely recognise what is being done – eating food and enjoying every mouthful. Food should always be placed on plates even when they’re not needed. It makes the meal feel more momentous and special. Books, phones, laptops, magazines etc. Everything should be put away. Eating is an important action and should be done in silence; it is not a healthy social activity. Sitting in nature, with fresh air is great way to enjoy eating. Starting a meal by being grateful and thanking nature for food – which many won’t get – is a great way to increase mindfulness in the eating process. It will also help develop a deeper relationship with both food as well as nature. The body sends us signals, but we are only able to see them if we are aware. When the body is full, usually a small sigh or burp is released. This indicates it is full.